Apologies by Publishers and Proof-Readers. The general Hebrew name for a preface is "haḳdamah." The saying "A book without a preface is like a body without a soul" is often quoted by authors as a reason for the preface. The origin of the preface may be traced to the "petiḥah" (opening), the text which the Rabbis cited before their lectures (Cant. R. i. 2). This petiḥah precedes many midrashic discourses. The first distinct preface is the letter introducing the "Siddur Rab Amram Gaon" (9th cent. ), and beginning, "Amram bar Sheshna, principal of the yeshibah of Matah Meḥasya, to Rabbi Isaac b. Rabbi Simeon" (See Prayer-Books). This style of prefatory letter is used by Maimonides (12th cent.) in the "Moreh"; in this case the letter is addressed to his disciple Joseph b. Judah, and is styled in the heading a "petiḥah." Aaron ha-Levi of Barcelona (13th cent.) prefaces his "Sefer ha-Ḥinnuk" with a "letter by the author." The word "mabo" (entrance) often takes the place of "haḳdamah." The introduction of Maimonides to Zera'im (translated into German by Dukes, Prague, 1833; original Arabic MS. and Hebrew translation edited by Hamburger, Frankfort-on-the-Main, 1902), the introduction to the chapter "Ḥeleḳ" in Sanhedrin, and the introductions to the "Yad" and the "Moreh" (besides the petiḥah), are called "haḳdamot," though the appellation was given probably by later transcribers of the manuscripts. The prefaces and introductions referred to are the longest and most important prior to the introduction of printing; moreover, they aroused much discussion and criticism—the preface to "Ḥeleḳ," because of the author's views on the principles of faith and on paradise. The preface to the "Yad" is severely criticized by RABaD because Maimonides therein expresses his wish to have his code supersede the teaching of the Talmud. The preface to the "Moreh" is remarkable for the statement that the author was determined to write it, even if he should benefit only one reader to 10,000 fools who would criticize him. Maimonides' preface to the "Yad" begins with Ps. cxix. 6. Rashi wrote a short preface to the Song of Solomon. Next in importance to Maimonides' prefaces is that of Ibn Ezra to his commentary on the Pentateuch. Isaac b. Abba Mari of Marseilles (12th cent.) prefixes a short preface to his "Sefer ha'Ittur"; incidentally he relates that at the age of seventeen he completed the chapters relating to "sheḳiṭah" and "ṭerefah." Zedekiah b. Abraham ha-Rofe (13th cent. ), author of the "Shibbole ha-Leḳeṭ" (edited by Buber, Wilna, 1886), begins with Ps. cxviii. 25, and explains his object in gathering the "gleanings of the ears of corn" from the decisions of the Geonim; he had found that "the troubles of worldly business vanities" left little time for the pursuit of learning. David Abudarham of Seville (1340), in his liturgical code, has a short preface on the title-page and a long preface preceding the body of the work. The early prefaces generally commence with the name of the author—"Said Abraham the Sephardi" (Ibn Ezra), for example, but are preceded by the name of God, whose aid is implored. The Maḥzor Vitry (1208) begins with , the initials of the wording of Ps. cxxi. 2. Azariah dei Rossi (1511-1578), before his preface to the "Me'or 'Enayim," explains the need of mentioning God's name before commencing any important work, as taught in Yer. Ber. v. 1 and Zohar, Tazria', 50a, 56b. Dei Rossi begins, "The Lord of Hosts is with us" (Ps. xlvi. 12). Prefaces were supposed to have been composed before the book. This may be true regarding the early writers, but in modern times they are in variably written after the book is finished. Many of the prefaces to the early works were wholly or partly omitted by the transcribers or the publishers. Indeed, some of the prefaces in the first editions were omitted in the subsequent editions, the publishers either desiring to save expense or regarding the preface as superfluous. For example, the preface of Menahem b. Zarah (1368) to his "Ẓedah la-Derek," which preface is of great historical valueand was published with the first edition, Ferrara, 1554, is omitted from all other editions. The same fate befell the preface of Israel ha-Levi Landau to his "Ḥoḳ le-Yisrael," on the 613 precepts (1st ed., Prague, 1798; see Jellinek, "Ḳonṭres Taryag," No. 56). The publishers, perhaps, recognized the general disinclination of readers to read the preface. Shabbethai Bass of Prague, in his "Sifte Yeshenim" (Amsterdam, 1680), the first Hebrew work on bibliography, says, on the title-page, "All I ask of the reader is to peruse my preface and learn what will be the benefit derived from reading the book." On the next page he greets his readers: "Blessed be he that cometh in the name of the Lord Sabaoth." The author enumerates ten benefits to be derived from reading his book (see Fürst, "Bibl. Jud." iii., p. lxxvii.). The preface is generally apologetic for the author's shortcomings and explanatory of the contents and object of the book. Sometimes the author extols his subject, and enlarges on the necessity of gratifying the public demand for enlightenment in that direction. The title of the book also is explained (see Titles of Books). The early prefaces are often elaborated with verses and with acrostics giving the name of the author and of the book. Sometimes a part of the preface is in rimed prose. In many cases the style is mosaic—a mixture of Biblical, Talmudic, midrashic, and Zoharic phraseology requiring an expert to comprehend the meaning and to appreciate the ingenuity of the author. Prefaces to cabalistic and theological works usually begin with words the initials of which form the name of God. Thus Joseph Albo (1380-1444), in his "'Iḳḳarim," begins the preface with . Some prefaces have catchwords either at the beginnings or at the ends of their paragraphs. The preface of David Gans to "Ẓemaḥ Dawid" (Prague, 1592) has the catchword "David"; Emanuel Recci's "Mishnat Ḥasidim" (Amsterdam, 1740), the word "Emet"; Malachi ha-Kohen, in his "Yad Mal'aki" (Leghorn, 1767), the word "Anna"; and in the approbation written in the form of a preface, the word "Kohen." Some prefaces are undated; in others the date is given by the numerical values of the letters in some appropriate sentence; sometimes the dates are given according to the era of the destruction of Jerusalem. Arnold Ehrlich, in his "Miḳra ki-Peshuṭo" (Berlin, 1899), dates the preface from the year of the American Declaration of Independence (see Colophon). Isaac Aboab, in his "Menorat ha-Ma'or" (Constantinople, 1514), has a general preface and a separate preface and epilogue for each of the seven parts of the work. The "Pi Shenayim," composed of excerpts from Midrash Rabbah, given in alphabetical order (Sulzbach, 1712), was compiled by two authors—Akiba Bär and Seligman Levi, each writing a preface. In some cases the prefaces were written by friends of the authors: for example, Zunz wrote a preface to Krochmal's "Moreh Nebuke ha-Zeman" (Lemberg, 1863), though this was after the death of the author. P. Smolenskin wrote many prefaces to books published under his supervision in Vienna. Some prefaces are in a different language from that of the work itself; for instance, E. S. Kirschbaum's "Shirim u-Meliẓot" (Berlin, 1820) has a German preface. Max Letteris, in his "Tofes Kinnor we-'Ugab" (Vienna, 1860), heads his preface with a quotation from Goethe, in German. As a rule, the poets are poor in their prose and especially poor in their prefaces. J. L. Gordon's preface to his "Kol Shire Yehudah" is in the form of a poem. The prefaces to N. H. Imber's "Barḳai" were written by Jehiel Michel Pines (vol. i., Jerusalem, 1886) and by the author's brother (vol. ii., Zloczow, 1900). Mordecai b. Judah Ashkenazi's "Haḳdamat Sefer" (Fürth, 1701) contains a special preface for his cabalistic work "Eshel Abraham." The author explains the presence of the isolated preface; he had found several copies of the "Eshel Abraham" with only a part of its preface; and, further, he desired to give poor readers an opportunity to possess at least the preface, if unable to purchase the complete work. The preface to Mordecai Aaron Ginzburg's "Toledot Bene Adam" (Wilna, 1832) was published separately (Benjacob, "Oẓar ha-Sefarim," p. 287). A preface by the editor or publisher is generally an apology ("hitnaẓẓelut"). The son of the author of "Eliyahu Miẓraḥi," on Rashi (Venice, 1545), apologizes for some of the ambiguous passages, which he explains as due to his father's dying before he had been able to revise the manuscript. The son appeals to the reader to apply to him for the solution of any difficult passage, requesting him to excuse the shortcomings of his father in any case. The press-corrector generally wrote a separate preface of apology. Benjamin b. Mattathiah, the author of "Binyamin Ze'eb," responsa, read his own proofs; and he apologizes for the typographical errors due to the employment of non-Jewish printers (ed. Venice, 1539). Similar apologies occur in the "Cuzari" (ed. Venice, 1594) and in "Pi Shenayim" (Venice). The press-corrector says: "There is not a just man upon earth that doeth good and sinneth not in the matter of type-errors, particularly at Sulzbach, where the pressmen are non-Jews who allow the type in the forms to be displaced." A noted press-corrector, Leon of Modena, wrote prefaces in verse—for example, in "Arze Lebanon" (Venice, 1601). In the publication of the "Miḳra'ot Gedolot" ("Biblia Magna"; Amsterdam, 1727) two press-correctors, one for the text and one for the commentaries, were employed, each of whom wrote a preface (before the Psalms). Of special interest are the prefaces of Christians to Hebrew books; for example: the Hebrew preface, in the form of a letter to Pope Leo X., in "Psalterium Giustinianum," dated 1516; the Hebrew preface to the "Miḳdash Adonai," Basel, 1534; that to the missionary "Ha-Wikkuaḥ" (Discussion) had as a heading the Latin term "Præfatio" over the Hebrew preface dated Basel, 1539. Jewish scholars in search of historical data utilized the data given in the prefaces of early works. In particular, Senior Sachs (b. 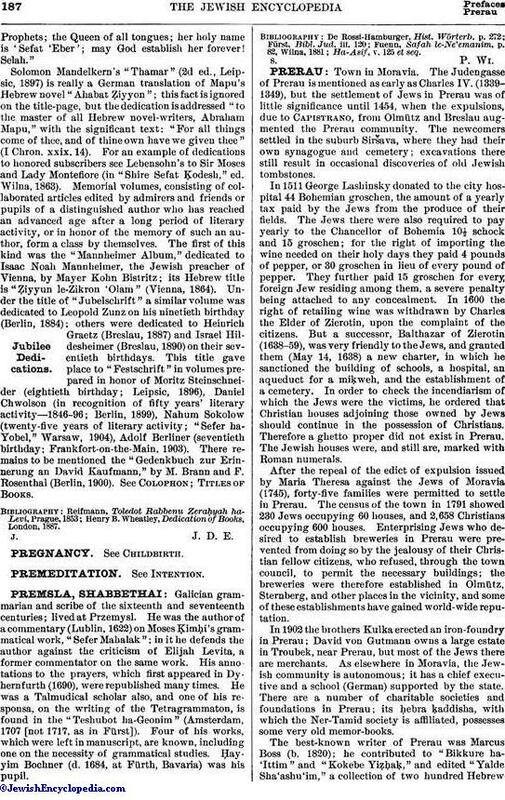 1816) became a famousinvestigator of Jewish antiquity by means of prefaces ("Keneset Yisrael," i. 833). ("letter by the author"; Sefer ha-Ḥinnuk," Venice, 1600). 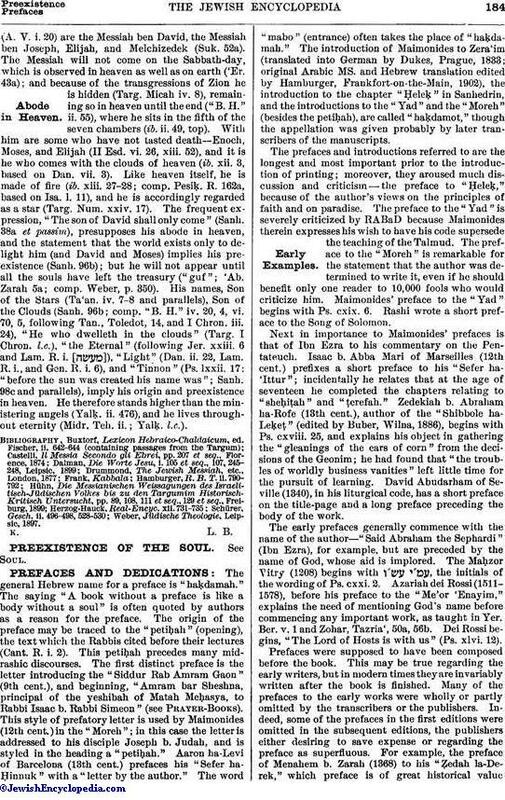 ("a word to the reader"; editor's preface; Proflat Duran, "Ma'aseh Ephod," Vienna, 1865). ("to the reader's eye"; publisher's preface; Bar Sheshet, Responsa, Riva di Trento, 1559). ("a word to the reader"; Bloch, "Shebile 'Olam," Warsaw, 1855). ("prefix"; the form generally used). 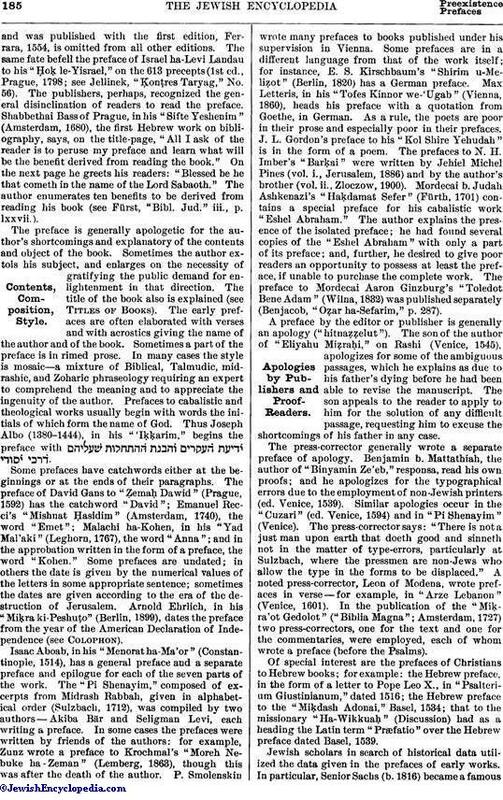 ("apology by the author"; Moses Ashkenazi, "Thesaurus of Synonyms," Padua, 1880). ("declaration at the beginning"; Benjacob, "Oẓar ha-Sefarim"). ("the opening of my mouth"; "Kol Shire Gordon," vol. ii., St. Petersburg, 1884). ("keys "; Yeruḥam of Provence, "Toledot Adam wa-Hawah," Constantinople, 1516). ("opening"; Judah Moscato, "Ḳol Yehudah," to the "Cuzari," Venice, 1594). ("opening word"; the Mekilta, ed. Weiss, Vienna, 1865). ("sweet reader"; "Paḥad Yiẓḥaḳ," Venice, 1750). ("honored readers"; J. H. Hirschensohn, "Sheba' Ḥokmot," Lemberg, 1883). A dedication, preceding or included in the preface, and addressed to a patron or to one who is beloved and honored, was frequently added by Jewish authors. Amram Gaon (9th cent.) dedicated his siddur to R. Isaac b. Simeon, who sent ten gold pieces for the maintenance of the yeshibah of Matah Meḥasya in Babylon, with a request for a copy of the work. Maimonides (12th cent.) dedicated his "Moreh" to his disciple Joseph b. Judah. Al-Ḥarizi translated the "Moreh" for certain great men in Provence. Ibn Ezra (13th cent.) dedicated his "Keli Neḥoshet" (ed. Edelmann, Königsberg, 1845) to his disciple Hananiah, and his "Yesod Morah" to Joseph ben Jacob, in London (1158). Isaac b. Joseph Israeli (1310) dedicated his "Yesod 'Olam," on astronomy, algebra, and the calendar (ed. Goldberg, Berlin, 1848), to his teacher Asher b. Jehiel. The dedication is perhaps the longest in Hebrew literature, and is distinguished for extravagantly eulogistic and complimentary phrases: "Peace, as wide as from the East to the West, and from the Ursa to the Scorpion, to the honored master, favorite and beloved of men, a mountain in wisdom and a river in knowledge," etc. Menahem b. Zarah (1362) dedicated his "Ẓedah la-Derek" (Ferrara, 1554) to Don Samuel Abravanel. Searching Spain and France for "a friend dearer than a brother," he finally found "the mighty prince" Samuel, to whom he devotes twenty-two verses. The dedication of Jewish works to kings and princes may be traced back to the Septuagint—the Greek translation of the Bible made at the time of Ptolemy Philadelphus (285 B.C.). Joseph ibn Satanas ( ), it is asserted, translated the Talmud into Arabic, for the sultan Al-Ḥakim, in 997 (Abraham Ibn Daud, in "Sefer ha-Kabbalah," ed. Neubauer, p. 69). Obadiah Sforno dedicated his "Or 'Olam," on philosophical research (Bologna, 1537), to the French king Henry II. David de Pomis dedicated his "Ẓemaḥ Dawid," a Hebrew-Latin-Italian dictionary (Venice, 1587), to Pope Sixtus V. Manasseh ben Israel dedicated his "Miḳweh Yisrael" (London, 1652) "To the Parliament, the Supreme Court of England, and the Right Honorable the Councilor of the State Oliver Cromwell. "Manasseh's "Nishmat Ḥayyim" was dedicated to King Ferdinand III., in a Latin letter prefacing the first edition (Amsterdam, 1651). Mordecai Gümpel ha-Levi dedicated his "Tokaḥat Megillah," a commentary on Ecclesiastes, to the president of the Swiss republic (Hamburg, 1784). Ephraim. E. Pinner dedicated his German translation, with text, of the tractate Berakot of the Babylonian Talmud to Nicholas I. of Russia (Berlin, 1842). A singular dedication is that of Moses b. Gideon Abudiente in his Hebrew grammar in the Spanish language (Hamburg, 1833; Steinschneider, "Cat. Bodl." No. 6418): it is addressed to God—"To the King, the King of kings, the Holy One, praised be Hel" and is signed, "Thy servant Moses" ("Orient, Lit." 1850, No. 24), Among Christians also, Spanish, Italian, and English authors occasionally dedicated their works to God. John Leycester, for instance, dedicated his work on the "Civil Wars of England" (1649) "to the honor and glory of the Infinite, Immense, and Incomprehensible Majesty of Jehovah, the Fountain of all Excellencies, the Lord of Hosts, the Giver of all Victories, and the God of Peace." The second among Jewish authors to dedicate his work to God was Abraham Mendel Muhr, in his "Magen ha-Ḥokmah," in defense of science (Lemberg, 1834). He boldly described it as a "letter to God," whom he refers to a passage in Maimonides' "Moreh" for confirmation of his statements. This style of dedication, and particularly the impious reference, were severely criticized by Reggio ("Iggerot Yashar," ii. 12, Vienna, 1836; Rubin, "Tehillat ha-Kesilim," p. 169, Vienna, 1880), who condemned it as blasphemy. Another interesting dedication is that of Gedaliah ibn Yaḥya, in his "Shalshelet ha-Ḳabbalah" (on chronology and history; Venice, 1587), to his first-born son, Joseph, when he became a bar miẓwah. Other books written by Gedaliah between 1549 and 1588 were dedicated to his father, grandfather, children, and grandchildren respectively. Moses Botarel dedicated his commentary on the "Sefer Yeẓirah" (Mantua, 1562) to a Christian scholar named Juan, quoting the saying of the Rabbis that "a non-Jew who is learned in the Torah is better than an ignorant high priest." Eliezer Lisser's "Ḥomat Esh," a commentary on a poem by Ibn Ezra (Berlin, 1799), bears a dedication on the title-page, addressed to David Hannover and his brothers in recognition of their patronage. Adolf Jellinek dedicated his "Bet ha-Midrash," a collection of minor midrashim, to Leopold Zunz (Leipsic, 1853). A. 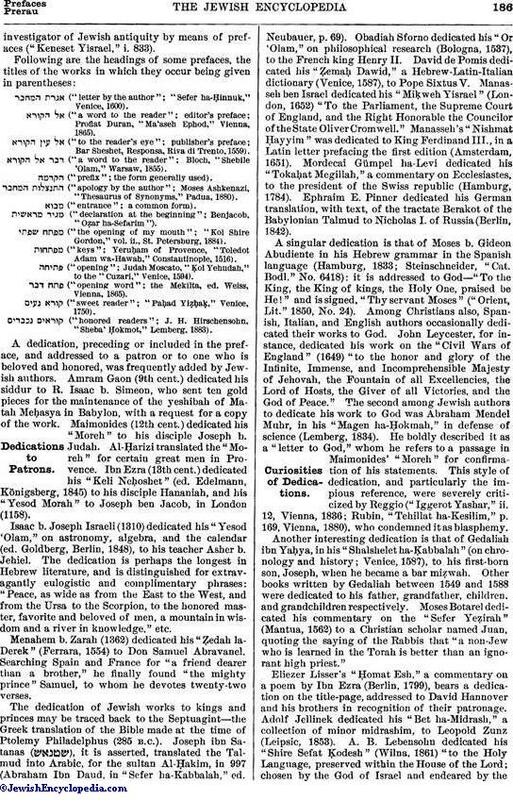 B. Lebensohn dedicated his "Shire Sefat Ḳodesh" (Wilna, 1861) "to the Holy Language, preserved within the House of the Lord; chosen by the God of Israel and endeared by theProphets; the Queen of all tongues; her holy name is 'Sefat 'Eber'; may God establish her forever! Selah." Solomon Mandelkern's "Thamar" (2d ed., Leipsic, 1897) is really a German translation of Mapu's Hebrew novel "Ahabat Ẓiyyon"; this fact is ignored on the title-page, but the dedication is addressed "to the master of all Hebrew novel-writers, Abraham Mapu," with the significant text: "For all things come of thee, and of thine own have we given thee" (I Chron. xxix. 14). For an example of dedications to honored subscribers see Lebensohn's to Sir Moses and Lady Montefiore (in "Shire Sefat Ḳodesh," ed. Wilna, 1863). Memorial volumes, consisting of collaborated articles edited by admirers and friends or pupils of a distinguished author who has reached an advanced age after a long period of literary activity, or in honor of the memory of such an author, form a class by themselves. The first of this kind was the "Mannheimer Album," dedicated to Isaac Noah Mannheimer, the Jewish preacher of Vienna, by Mayer Kohn Bistritz; its Hebrew title is "Ẓiyyun le-Zikron 'Olam" (Vienna, 1864). Under the title of "Jubelschrift" a similar volume was dedicated to Leopold Zunz on his ninetieth birthday (Berlin, 1884); others were dedicated to Heinrich Graetz (Breslau, 1887) and Israel Hildesheimer (Breslau, 1890) on their seventieth birthdays. This title gave place to "Festschrift" in volumes prepared in honor of Moritz Steinschneider (eightieth birthday; Leipsic, 1896), Daniel Chwolson (in recognition of fifty years' literary activity—1846-96; Berlin, 1899), Nahum Sokolow (twenty-five years of literary activity; "Sefer ha-Yobel," Warsaw, 1904), Adolf Berliner (seventieth birthday; Frankfort-on-the-Main, 1903). There remains to be mentioned the "Gedenkbuch zur Erinnerung an David Kaufmann," by M. Brann and F. Rosenthal (Berlin, 1900). See Colophon; Titles of Books. Henry B. Wheatley, Dedication of Books, London, 1887.